Monday is Memorial Day in the US, a day for remembering the people who died while serving in the US armed forces, and barbecuing. 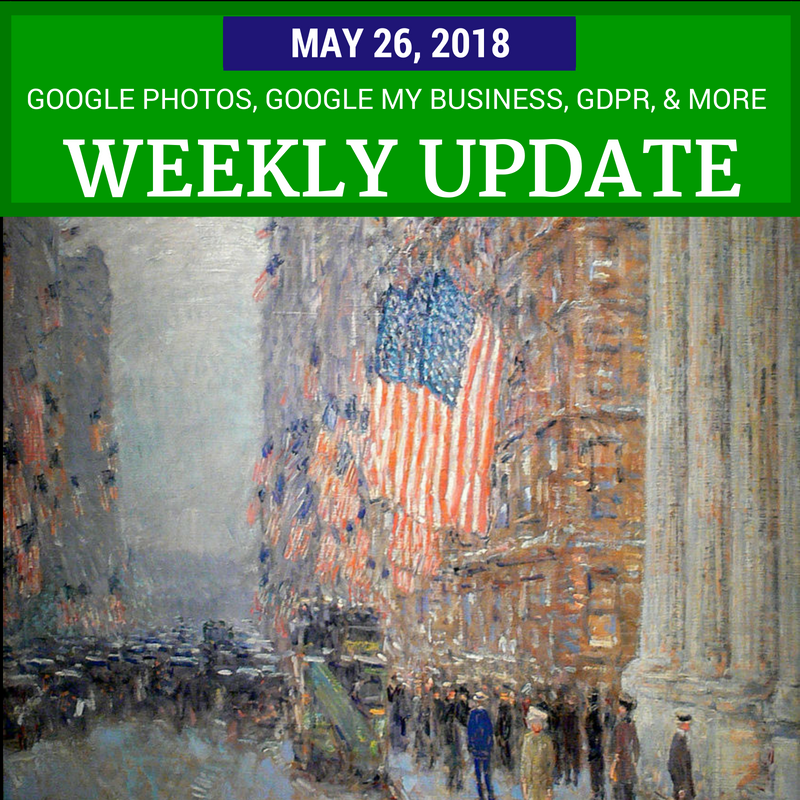 Start your holiday weekend with some nice updates and be glad the flood of GDPR-related privacy updates should be down to a trickle. You can now “give some love” by ❤️ing photos shared with you in Google Photos, and ⭐ your favorite photos to add them to a special “Favorites” album. Google Lens got a bit smarter, with real-time search and smart text selection. This week YouTube mentioned they had been testing algorithmic sorting of the subscription feed, and they got an earful of (mostly negative) feedback. Business owners are regularly targeted by companies claim to represent Google, promising high search result rankings or charging money for Google’s free services. This week Google took legal action against some of the scammers, and rolled out new tools for businesses, including a way to report scammy practices and policy violations, and a new Google My Business Partners program, to create a directory of trusted service providers. Unless you’ve been living under a rock - or never used an online service or signed up for an email list - you are aware that the European Union’s General Data Protection Regulation (GDPR) went into effect yesterday, May 25th. Already there have been repercussions: some relatively small, like EU users no longer being able to use some US news sites, Instapaper, or their “smart” lightbulbs; and some big, like Facebook and Google being hit with $8.8 Billion in lawsuits as soon as the law went into effect. If you have questions or concerns about your privacy or how Google uses your data, check out Google’s Privacy Troubleshooter. If you are an AdSense publisher or have a Blogger blog, read the information provided by Google about compliance. Or maybe just have a chuckle that your service or site isn’t in the GDPR Hall of Shame. See below for links with more tips and updates for live streamers, webmasters, Plussers, AdSense Publishers, and more. Always take leaked "exclusive" information with a giant pinch of salt - and send feedback!